'Tis a week before Christmas ... Beth is on the road ... Mike is in front of a computer monitor. Pretty typical. Only 7 days to write a letter to meet the holiday deadline. Looks like we are going to slip the schedule. Pretty typical. Will you give us until the end of the year? Beth finished her holiday painting early enough that Eddie gave us time on his high-end color copier. He seems to remember Beth's work. She even used paper that matches the aspect ratio of his machine. Must have been an accident. Mike can never get her to match the area of the scanner, so he can include it in her gallery. 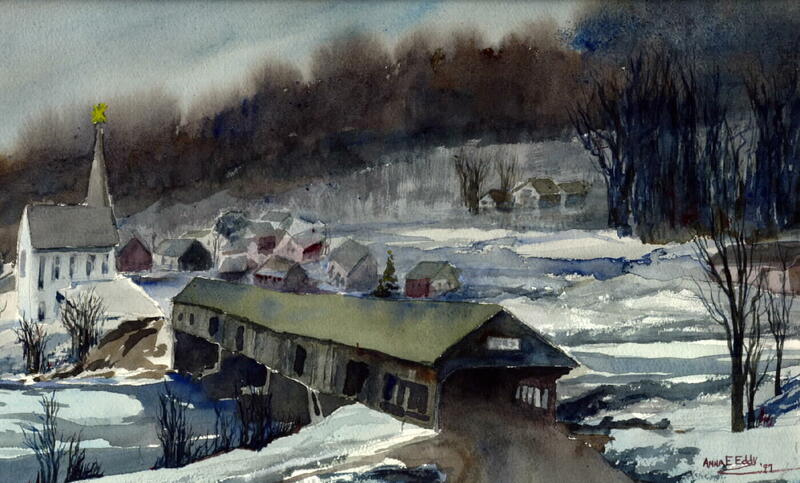 Her painting is from New England ... New Hampshire looking across to Vermont. We were there this summer, but the painting scene is from a picture taken a few years ago. Beth has quite a backlog of subjects to paint. This summer we went to the top of Mt. Washington ... maybe that will be the subject of a painting sometime. Anne & Steve still live in their 200+ year old house, which also overlooks into Vermont. It's no longer an Inn, or, it's not an Inn at the moment ... they still provide the same wonderful hospitality. After a couple of days at their non-Inn, was when we toured Mt. Washington, staying at the hotel, where Anne & Steve joined us for dinner. The next day we took the cog railway up Mt. Washington. Perfect day ... quite a thrill. From there, we toured the coast of Maine. Then on to the second of two weddings of brides each named Jenny. The bride of this wedding is a cousin of Beth's. This wedding brought together the whole of Beth's father's side of the family. Quite an event ... a weekend of parties at the Yankee Pedlar Inn, Holyoke, MA. Now, one would think that this would suffice for the annual Antal reunion, but noooo. We gathered again, 3 weeks later, at Beth's parent's farm in Strongstown, PA. The other wedding was in Chicago. This Jenny is the daughter of one of Beth's college roommates. It too was a reunion ... Beth visiting with Leslie's & Jim's parents for the first time in quite a while. This too was a serious of parties in a hotel just outside Chicago. Mike wondered whether partying too much was the cause of our being kicked out of the hotel ... but Beth confessed that she had mixed up the dates. No problem, we just dropped in on Chie & Jack and then Fran & Jim for yet another "gourmet" group. Mary & Gaylord live just blocks away, and Judy & Bob drove down from the UP. Speaking of parties, Mike must tell of the surprise 50th birthday dinner in NYC. He had to work late before joining Beth a Friday night before a Saturday concert (by Paula Robison). He knew that Carol & David were also to come up from Raleigh for weekend and concert. What he did not know was that Beth had reserved a large table which also included Harry & Bev, Toetie & Phil, Sue & Bob, Jan & Gerry. He was very, very surprised when he arrived (a couple of hours late). The party had started without him, but he soon got up to speed. Mike guesses that Beth still hasn't "forgiven" him for her surprise 40th. Then, again, one can be surprised at any age; just ask Mary Follett. Paula Robison's concert that weekend was quite good. She has done a couple a year for the last few years. The setting is dramatic -- the Temple of Dendur in the Met. Besides these concerts, we subscribe to a Chamber series at the Lincoln Center. Another excuse for going into the city is the Joyce Theater, home of some of the best modern dance. However, it is up to us to get there, as Paula & Merrill no longer provide Joyce planning. Paula & Merrill have (finally) moved to Atlanta. We guess they couldn't milk the move for any more going away parties? (Just kidding.) We will visit them in their new place in downtown Atlanta on our way to spend Christmas with Beth's parents in Charleston. In Charleston, we will be joined by Beth's sister Kay and her husband Ted. All three sisters would have been there, but Margie's husband Joe played chicken in his truck. The other truck was bigger. Joe wisely decided not to travel this holiday. Keep getting better, Joe. And, we have to hear this story in person, soon! We spent Thanksgiving with Mike's mom in Seattle. Technically, this was the second time we visited with her this year. Last Christmas, she stayed through New Year's, because Seattle had been buried under a foot of snow. This year's visit had no snow, but plenty of interesting weather. One day we could see all the mountain ranges in every direction. We have come to the definite conclusion that the misty, foggy image of Seattle is just what they tell to keep too many people from moving there. As you can conclude by now, we have been pretty busy this year. Mike would love to tell stories of his most recent fishing trip. Would you believe that he caught fish? Ask him, if you dare. He'd love to bend your ear about PCs and PC parts and PC shows (his best find this year was $90 for a dual Pentium baseboard and cpu card). Ask him about that, too, if you dare. Beth, again, has been traveling, traveling, traveling. She came back from one trip to Cheyenne telling of wild mustangs. (not like the red 65 that George bought for Kathy's 50th.) Beth and cousin Janey searched for (and found) the four-legged kind in the canyons near Craig, CO. Beth says that Mike just has to see Janey & Jim's place ... what a view. Now, there is even less time to Christmas. This letter must be copied, the envelopes addressed, stuffed and sealed. We guess that it is time for a wrap (so to speak). We hope that your year has been as full and rewarding as ours has. We wish that we could sit and chat with each one of you by the fireside this holiday. Come to NJ and visit us. Beth will stay home. Mike will log off. If you sit still enough, the cats will come out of hiding.